Labor Day is Monday, but this lentil and vegetable loaf will make dinner any night of the week feel like a holiday celebration. 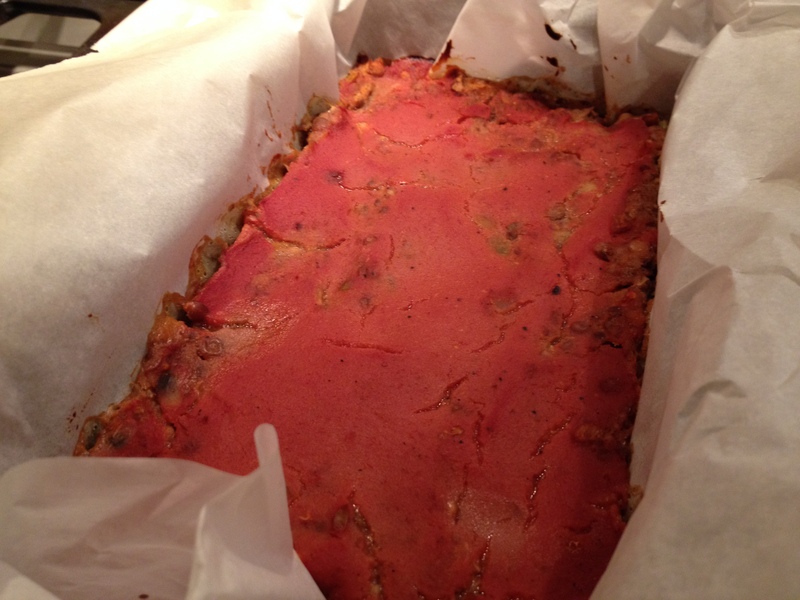 If you look on almost every vegan blog, you’ll find a recipe for some sort of lentil loaf. It’s pretty much the vegan stand-by for meatloaf. I was inspired to create my own recipe for a special reason. I’m on a mission to come up with recipes that my neighbors’ family of self-proclaimed vegetable-haters will enjoy. They are Polish, and the wife has told me their diet consists of primarily fried foods and is heavy on meat. The only vegetable they all like is carrot, she said. But, she said, both she and her husband suffer health conditions that she knows would benefit from eating more fresh veggies and less fried meat. I showed her photos on my phone of several gluten-free and vegan meals that I have made, and she seemed open to trying a few of them. Any recipe loaded with vegetables and that screams “I’M VEGAN” is out. I don’t want to overwhelm them. Thus my challenge to create meals that will slowly introduce them to plant-based eating without moving so far away from the meaty flavors they are used to. I think this lentil and vegetable loaf will do just that. 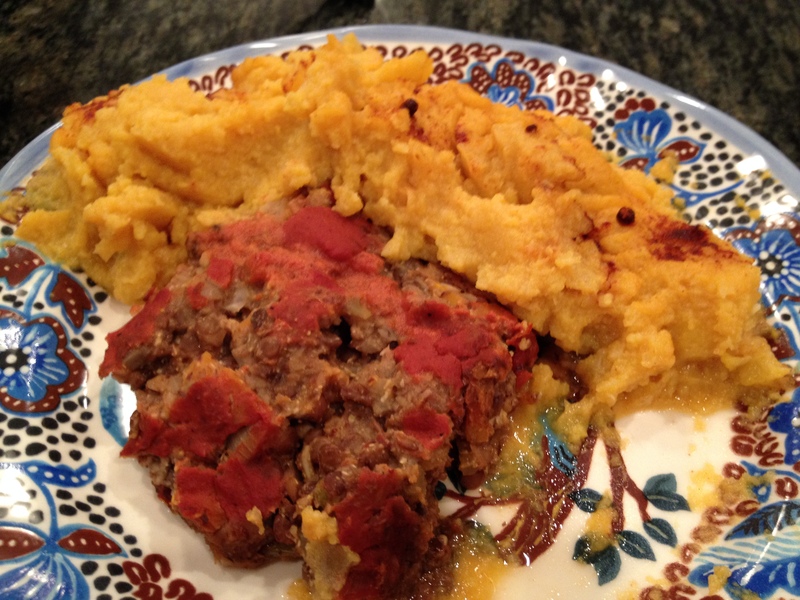 It certainly reminds me of my meatloaf memories… even if I haven’t had meatloaf in more than 10 years. 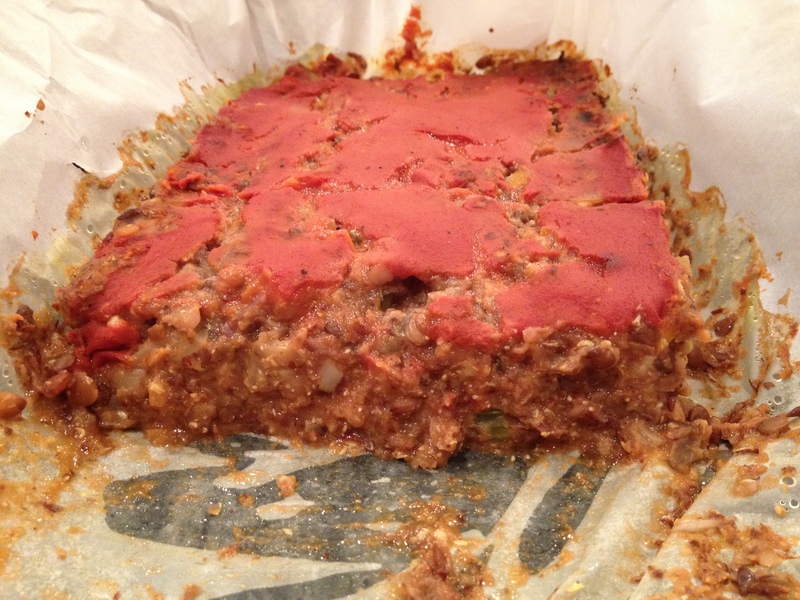 The key to this lentil loaf is the tangy barbecue sauce. I don’t like a sweet sauce, so this one doesn’t have any added sugar. Instead, the barbecue spices take center stage in my sauce and yield a great flavor without being too sweet or too spicy. If you are someone who enjoys a sweeter bbq sauce, feel free to substitute your own store-bought favorite. About an hour before you plan to start cooking, begin by preparing the barbecue sauce and flax egg. For the sauce, combine all the sauce ingredients in a small bowl and place in the refrigerator until ready to use. For flax egg, mix the ground flaxseed with six tablespoons of water until well incorporated. Place in the refrigerator with the sauce. When you’re ready to start cooking, preheat the oven to 375 degrees. Cook lentils in water with 1 teaspoon of salt according to the package directions. Mine are quick-cooking and only take around 10 minutes. Whatever kind you use, make sure all the lentils are fork tender and all water is gone. While the lentils cook, add the broth to a small skillet and bring to a boil. Once it begins to boil, reduce to a low to medium heat and add the finely chopped veggies. Cook the veggies for about five minutes and all the veggies are soft and the broth is gone. Then when both the lentils and veggies are done, add half the cooked lentils and all the veggies to a large bowl. Using an immersion blender, puree the other half of the lentils and then add them to the large bowl with the whole lentils and veggies. Grab your flax egg and barbecue sauce from the refrigerator. Pour in all the flax egg and 3/4 of the sauce to the large bowl. Mix well until the sauce and flax egg are well-incorporated to the lentils and veggies. Line a bread loaf pan with parchment paper. Spoon the lentil and veggie mixture into the pan and spread until it’s evenly distributed in the pan. Then top the mixture with the remaining sauce. Bake 50 minutes. The edges of the loaf should be brown and a toothpick inserted into the loaf should come out clean. Bake it longer if necessary. Let the loaf sit at least 15 minutes before cutting. The loaf makes four generous servings.